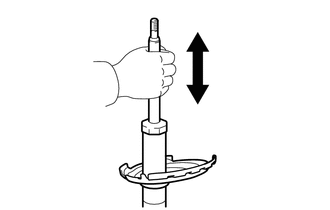 (a) Compress and extend the shock absorber rod 4 or more times. There is no abnormal resistance or sound and operation resistance is normal. (b) Check for any oil leaks. (c) Check for any damage on the absorber rod. If there is any abnormality, replace the rear shock absorber assembly with a new one.